The fireplace in the Studio was going to remain plain. Change of heart set in. I had them tile it. I had the tiles, so it was no big deal for them to pop them on the wall. Happy I did it. I do love it and think it will look great when the mantle is installed. The trim will be painted cobalt. On another note, when the Studio is complete, I will be putting a half roof on the terrace so there will be shade. It faces West, so shelter is needed from the hot afternoon sun in the summer. 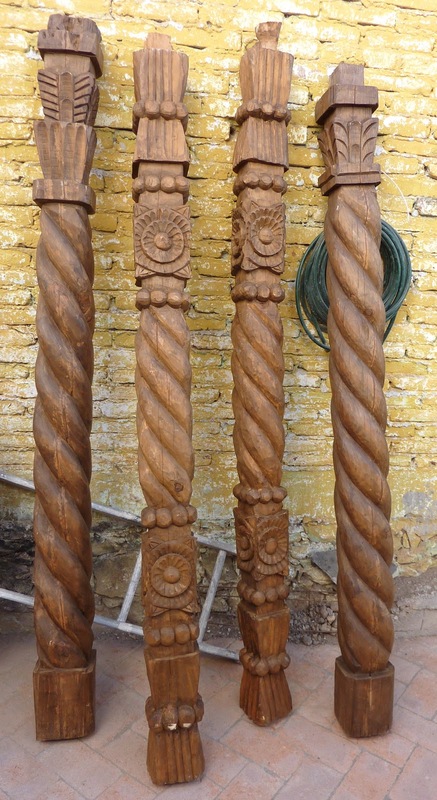 Months ago I found some hand carved posts which I fell in love with, however had no use for. Now I do .... so I scurried back to see if they were still there. YEAH! There they sat, just waiting for me. I only need two, however got such I good price I took all four. The two I don't use, I will stash until I can afford to put a roof on the back terrace. I realize you in Canada and some parts of the States will laugh uproariously at this statement. I am cold! At the moment (7:45 AM) it is 41 degrees F. My fireplace isn't working properly and I'm heating the house with my oven door open. (Yes, I know, that's funny too.) The high today will be 73 degrees. A nice temperature, however, it won't begin to warm up until late morning. When the sun sets about 6:00 pm, it instantly cools off. High desert stuff. It gets dark very early now. I'm looking forward to solstice and the coming again of the light. I love the longer evenings. So there you have it ... my take on December weather in San Miguel. My Canadian blood must be getting thin. Your tiled fireplace is gorgeous and so are the hand carved posts. How lucky for you they were still available. You do have an eye for the unusual. On Monday, I'm taking the pieces of wood for the mantel to the carpenter to have them cut and plained. It will be interesting to see how that turns out. The fireplace is wonderful! I thought about a little fake one, but, alas, my room is really too small. I get it about the cold, tho. Same thing here and since we rarely use heat, those mornings in the 40's can be really nippy... time for a dip in the hot tub! Maybe you could add a little one to your patio! It can work wonders on a cold body and the heat lasts a long time. Have to have it cranked up, tho (like 107)! Oh I so agree about the hot tub! No hot tubs in sight in Mexico. I'm thinking about putting an antique claw foot in the jardin. Don't quite know yet - but really want to do something. Any really creative ideas? The fireplace is amazing. I love seeing work in progress. I'm going to save all these ideas for when I build a house from the ground up...(just kidding--probably never happen), but still, this is a marvelous journey. Love seeing it all put together.